Before committing myself to photography and video production full-time, I spent the better part of ten years in web design and development. While working in that arena, I discovered the rich world of open source technology and WordPress. One of the folks I met along the way is Aaron Hockley, WordPress evangelist, and fellow photographer. When I found out that Aaron was launching wp-photographers.com, a blog dedicated to helping photographers better understand and manage WordPress, I had to know more. The site launched a few weeks back and Aaron was kind enough to answer a few questions for me. Please tell us a little bit about yourself; your experience as both a photographer and WP user. My background is in technology – software development to be precise. I started working with blogs in 2001 and began using WordPress in 2004. I’ve blogged personally and professionally since then and have become quite involved with the community around WordPress. I founded WordCamp Portland and have spoken at a few dozen WordPress and blogging events on the national and local level. Photographically, I began shooting as a hobby around the year 2000 and began working professionally in 2008. My pro work generally involves special events and portraits, with a majority of my clients being somehow connected to the technology industry in the greater Portland area. Where did the inspiration for wp-photographer.com come from, and who is the site for? 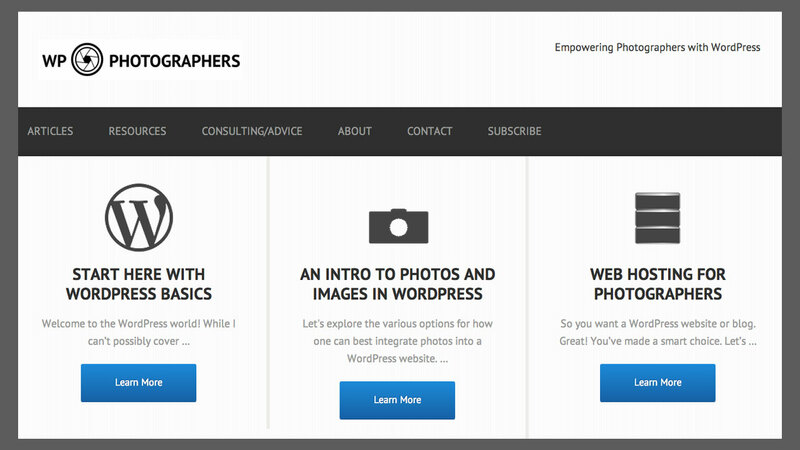 I see WP Photographers catering to two audiences: the first being photographers who want to have a better online experience with WordPress, and the second is the general WordPress user community who wants to better integrate photography on their websites. I’ve been answering one-off questions, doing some consulting, and writing articles in this realm for a while, and WP Photographers seeks to bring that together into one place that will become the destination for all things mixing WordPress and photography. Why do you think WordPress is the ideal platform for photographers to market their services and their work? The open source nature of WordPress combined with the fact that it’s over 10 years old means that a thriving community has formed around the software. There are plugins and themes that can make WordPress do nearly anything. There are hundreds of meetup groups and events worldwide every year that provide the opportunity for WordPress users to connect and learn with each other. What would you say to photographers who may be intimidated by WordPress? Just like photography, start slow. You don’t need to understand code or how to write a plugin – start by learning how to create a simple blog post or page. Find a learning resource that matches your style – some folks like classroom learning, others prefer books. There are hundreds of meetup groups worldwide — wordpress.meetup.com. See if there’s one near you. There are thousands of WordPress plugins and themes. How would a photographer know which ones are good or which should be avoided? It’s a challenge – there are some really amazing plugins and themes, some average ones, and some that should be avoided for various reasons. In general, look for recommendations from friends or trusted websites – if you simply Google for options, the results are sometimes questionable. WP Photographers is in its infancy, but I intend to build up a set of reviews and recommendations for the best options in various photo-related categories (portfolio themes, services themes, lightboxes, galleries, and so on). The first such review is of the Modern Portfolio theme. Tell us a bit about the WordPress community; specifically WordCamps and what they can offer to photographers who are exploring WordPress. WordCamps are locally-organized, volunteer-run events run under a set of guidelines from the WordPress foundation with the goal of helping foster learning and connections in the WordPress community. WordCamp events offer affordable (generally $20/day or less) opportunities to learn from local and out-of-town experts on a variety of WordPress-related topics. Some of the sessions will be for developers and designers, but there are also topics relevant to photographers, with most WordCamp events offering several sessions around using WordPress as part of your business’ online presence. Any plans to build a community around the blog? It could be a useful learning & networking tool. I could be all Apple-like and refuse to talk at all about future products, or… heck, here’s what I have in mind: right now my focus is on building the base content and establishing the direction for WP Photographers. I plan to launch an accompanying podcast this fall, featuring both my take on WordPress/photo topics along with interviews with people in the space. I’m looking at the idea of a membership community in the future; I agree it might be a great place for photographers to share WordPress tips, recommendations, and experiences. For photographers already using WordPress, what one tip can you offer that can improve the value and usefulness of their WordPress site? I’m going to cheat and offer two tips… the first one is kind of boring but really important: keep your WordPress site up to date. If you’re hosting your own WordPress site, current versions of WordPress will update themselves, but you still need to update your plugins via your WordPress admin dashboard. Other than weak passwords, out-of-date software is the biggest cause of web security (“hacking”) problems. For a second, more interesting tip: improve your blogging efficiency by writing a few posts at a time and then scheduling them in the future. WordPress has post scheduling built in, and you can use the Editorial Calendar plugin to help visualize and plan your future articles. This allows you to space out and plan your articles in advance rather than feeling pressure each week to write something new. Want to know more about Aaron? Check out his website and follow him on Google+ and Twitter (@ahockley & @wp_photogs). Gary – Do you use WP? Reblogged this on lutherlking's Blog. Terrific! I just started a photography blog about a month ago without knowing the first thing about what I was doing. Hopefully, I will be up to speed soon. I wish I’d had this site when I started on WP. It looks like it will really be of help. Steven – Very glad this will be a useful resource for you.